With an enthralling live show that has won over countless fans and critics, Los Angeles quartet Henry Clay People are thrilled to hit the road this summer in support of their upcoming album Twenty-Five for the Rest of Our Lives. 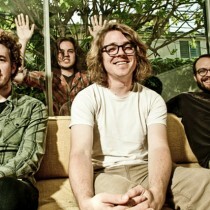 The five-week tour beginning June 14th will see the band share the stage with Motion City Soundtrack, These United States and Futurebirds, along with their own headlining dates. Set for a June 26th release on TBD Records, Twenty-Five for the Rest of Our Lives is a thrilling and sweaty thirty minutes of teenage restlessness. Evident in new songs “Hide” and “Friends Are Forgiving” – two of the twelve songs that make Twenty-Five for the Rest of Our Lives the bands most urgent, bratty, and melancholic record to date.